A personalised school outdoor welcome sign to greet children, parents and visitors to nurseries, pre-schools and primary schools. 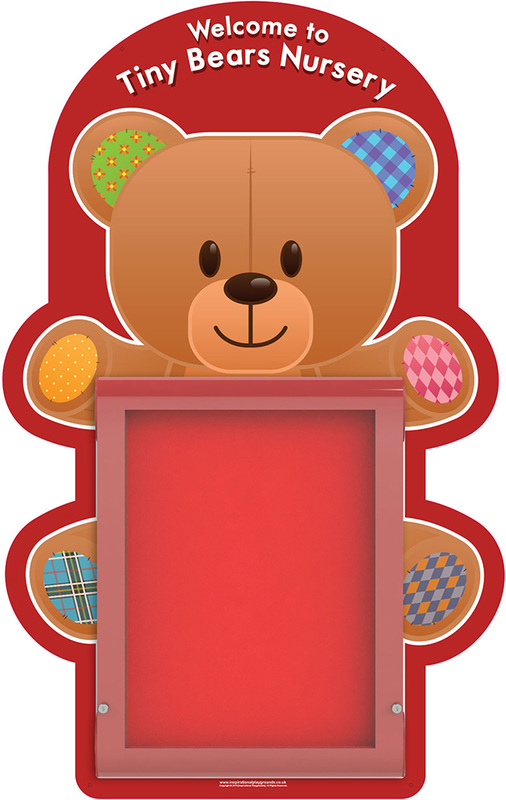 With a fun teddy bear design, this welcome sign doubles up as an external notice board which can be used to display important information and notices. The teddy bear design is printed on a rigid, heavy duty plastic back board. This graphic can be personalised by adding up to 30 characters to the printed ‘Welcome to’ message. The printed panel is UV light and weather resistant so will last outdoors in all weathers. In front of the printed back board is a fully weatherproof outdoor notice board. Tested to comply with IP55 test for dust and water ingress, this notice board has a double seal and fully enclosed case to ensure rain or moisture cannot penetrate. Inside the notice board has a red felt covered pin board – easy to use pins to display information. This interior core and fabric is fire rated and complies with Fire Retardant Class 0 and BSEN13501:2002. The notice board has a powder coated aluminium frame in a red finish and is fixed in a portrait position. The door has two locks and in hinged along the top edge. Twin gas struts provide assisted door opening and the door will open to a 90o angle to ensure easy access to change contents inside. It will hold up to four A4 sheets in portrait orientation. Please note: the noticeboard included has red frame and red felt interior. Images of grey/blue noticeboard are for product illustration purposes only.